PREHEAT: the oven to 375°F. 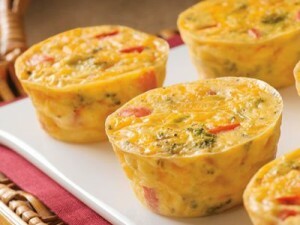 Lightly spray two 12-cup muffin pans or one 10-inch pie dish with cooking spray. VEGGIES: Saute the red pepper and broccoli in a little bit of olive oil until most of the liquid has evaporated from the peppers and the broccoli is slightly soft. 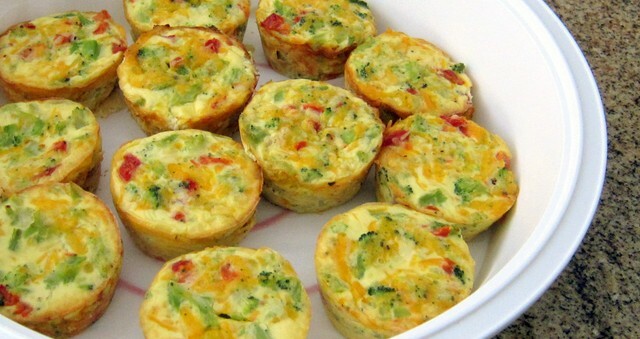 There should be about 2 cups veggies after they are cooked (you can use any vegetables you like). EGG MIXTURE: Whisk together the eggs, milk, salt and pepper. STIR: Stir in the cheese, cooked veggies, and green onions. Pour it all into the pan or cups. 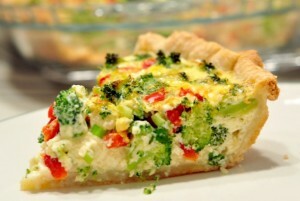 COOL: Let the quiche cool for 5-10 minutes before serving. It can also be served at room temperature or cold.